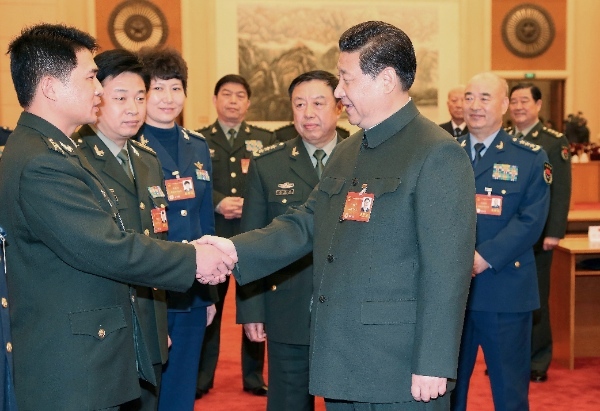 Chinese President Xi Jinping told the delegation representing the People’s Liberation Army at China’s annual Parliamentary session that the country will pursue reforms to build a strong military. He said his government will prioritise reforms to modernize the PLA and that Beijing will offer more policy support to help strengthen the military. He says the government will play the leading role in building a strong military, and proposed that the market also has a role to play by jointly creating “a highly effective development pattern that features army-civilian integration”. Xi, who also heads China’s National Security Commission, reiterated that China is a peace loving country but will safeguard its legitimate rights. “We expect peace, but we shall never give up efforts to maintain our legitimate rights, nor shall we compromise our core interests, no matter when or in what circumstances,” Xi said. China plans to raise its defense budget by 12.2 per cent to 808.2 billion yuan ($132 billion) in 2014, according to a draft budget report submitted to the country’s national legislature for review last week. Chinese state-run media has criticized the western narrative on China’s defence spending. According to Xu, China’s military spending for each of its 2.3 million members of military personnel is a little more than $57,000 this year, which is very low compared to the US, which has about 1.44 million military personnel in service with its per-head military spend standing at more than $365,000 dollars, about six times that of China. China has in recent months stepped up its anti-terror battle with the Chinese President Xi Jinping at the helm of the National Security Commission. Beijing pointed to external terror links after twenty-nine people were killed and 143 wounded in a terrorist attack in Kunming on March 1. China’s national security experts have said those responsible for the Kunming attack have links to terror groups outside China. China’s energy-rich Xinjiang has been beset by violence as 100 people were killed in the region in recent months. In February, security forces killed 11 terrorists near Xinjiang’s border with Kyrgyzstan. Five suspected Islamist militants were arrested in October after a terrorist attack on Beijing’s central Tiananmen square. International media reports on these recent terror attacks on China have accused Chinese authorities of heavy-handedness and a clampdown on religious freedom.